Thursday, 16. 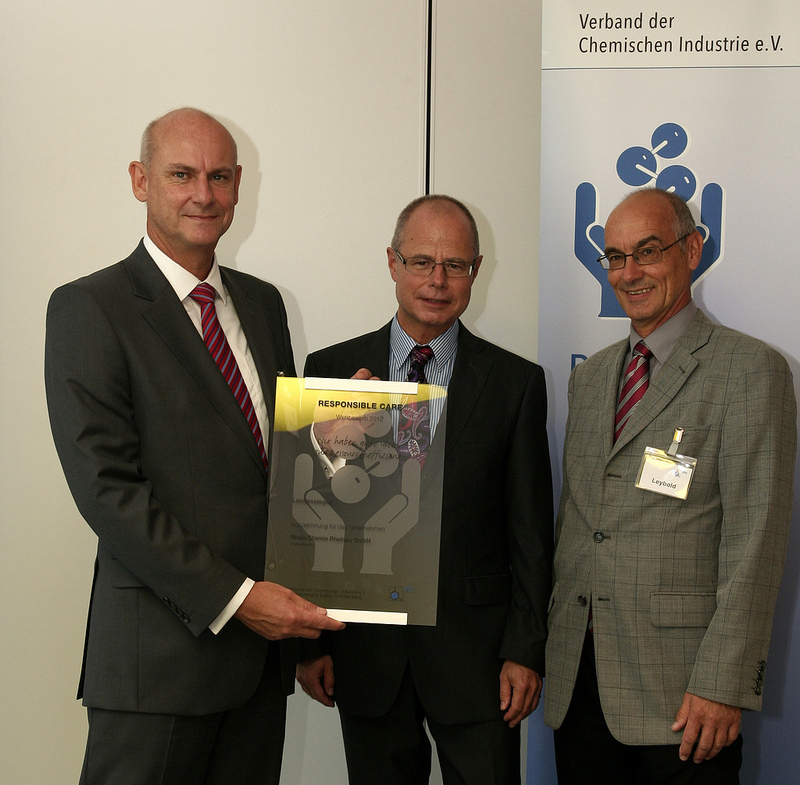 August 2012 Rhein Chemie Rheinau GmbH has been honored for its commitment to sustainable production processes. In this year's Responsible Care competition held by the Baden-Wuerttemberg branch of the German Chemical Industry Association (VCI) the company won first prize for an innovative process for recovering phenol from mixed wastewater streams generated in the manufacture of a plastics additive. Mannheim, August 16, 2012 – Rhein Chemie Rheinau GmbH has been honored for its commitment to sustainable production processes. In this year’s Responsible Care competition held by the Baden-Wuerttemberg branch of the German Chemical Industry Association (VCI) the company won first prize for an innovative process for recovering phenol from mixed wastewater streams generated in the manufacture of a plastics additive. Responsible Care (RC) is an international initiative of the chemical industry. It is aimed at continuously improving the conditions for health and environmental protection and for the safety of employees and the communities near production sites – independent of statutory requirements. The prize was presented in Baden-Baden on August 16, 2012. The process involved in producing a special additive used in the manufacture of certain high-grade plastics, for example for large-volume drinks bottles, leads to the generation of mixed wastewater containing a large amount of phenol. Phenol is an important base chemical and is produced from crude oil. Residues containing phenol have to be disposed of as hazardous waste, however. “The challenge with this project was to recover a pure raw material from a wastewater mixture containing various readily and poorly water-soluble chemicals,” explained Dr. Ruediger Herpich, head of HSEQ at Rhein Chemie. A team of experts from Rhein Chemie’s production, laboratory and applications technology units succeeded in removing phenol from wastewater and recycling it into the production process again by way of a special process. This technical solution will make it possible to cut the amount of phenol to be disposed of by around 150 metric tons (around six large articulated trucks), and the volume of hazardous liquid waste by even more.